Monster launches wireless, iSport and Adidas headphones | What Hi-Fi? Monster makes additions to its sports line, including the “world’s thinnest Bluetooth headphone”, and a new collaboration with Adidas. The first new model is the iSport SuperSlim (£130) (pictured). Monster is touting them as being the “world’s thinnest Bluetooth headphone” and says they can be worn comfortably underneath helmets and goggles. The second new model is a wireless version of the iSport, called iSport Bluetooth Wireless (£90). They offer a similar audio performance, but without the slim design. 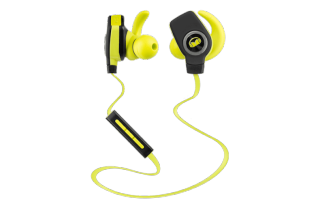 Both pairs feature a 50ft wireless range, five hours of playback time, are sweat-resistant and washable. They also come with Monster’s patented earhook and angled ear tips and ControlTalk on the cable for hands-free calls and music adjustment. The iSport range is now made up of seven models: the flagship iSport Victory (£130); iSport Intensity (£80), which allow users to hear noises around them, while still receiving “100% of the music from a media device”. The iSport Strive (£40) has been given two new colour options: orange and black and the iSport Freedom on-ear headphones (£230). Monster has teamed up with Adidas once again to introduce a new range of headphones targeted at runners. The new models are the Supernova in-ears (pictured) and Response earbuds. The Supernova offers “total noise isolation” to block out unwanted external noise, while the Response offers a non-isolating design, so users can still hear sounds around them. The Adidas Sport range benefits from Monster’s Pure Monster Sound technology, which promises to deliver the best techniques and methodologies from within the audio industry. They’ll work with the Adidas Go app for iOS and Android devices. The app will increase or decrease the tempo of the music being played, in accordance with your running pace. Both pairs will be available later in July, the Supernova will cost £90 and the Response £40.